Tandoori Chicken is a popular Indian dish.Chicken is marinated with yogurt and some spices.It is hot and spicy.It is traditionally cooked at very high temperature in a clay pot known as tandoor.But can also prepared in grill oven.I always love homely food.We can make tandoori chicken right in your home.So why dont you go to restaurents ,you can make at your home kitchen. I grilled my tandoori chicken in my gas oven.I never used any oil in this. In between this grilling time I checked the chicken pieces .That will avoid the pieces not to turn black and check whether it is cooked. In chicken pieces make some slits to coat the marination deeply. Mix all the above ingredients together.Then we get a smooth paste.Marinate the chicken pieces with this paste.Marinated chicken pieces can set in fridge for 4 hours or more.The curd act as a tendetizer which helps the chicken to be soft. Use Kashmiri red chilli powder,So it has a bright red colour.I never used food colour. Preheat the oven or grill pan.Gently place your chicken pieces on it.Keep the oven or flame in medium. Ready ready ready..Yummy tandoori is chicken ready..This is for chicken lovers.. Serve as an appetizer with a slice of lemon and onion rings. 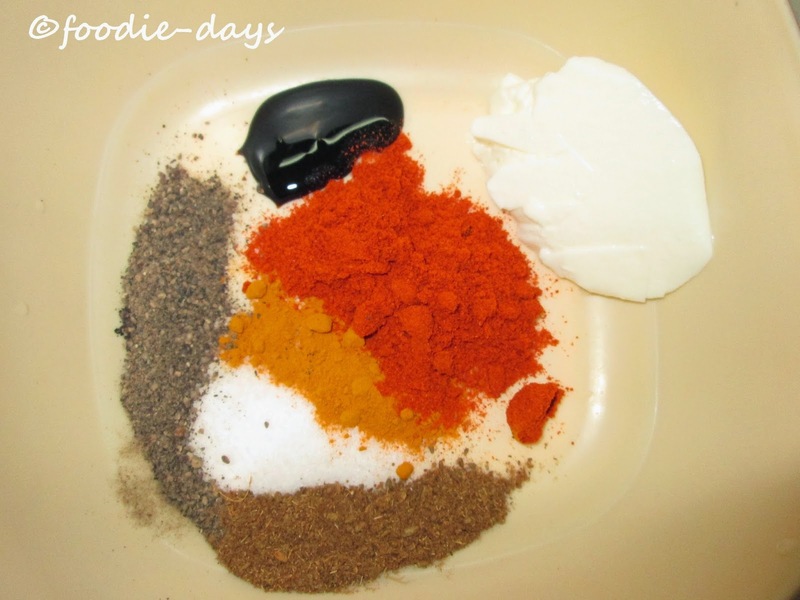 Spice powders ,yoghurt,Soysauce and salt. Make slits in the chicken pieces.To coat the marination finely. Done..Set aside for 4 hours. Take your grill of oven or the grill pan which you are using..
Ready to eat..Serve with a piece of lemon..